South Africa’s national parks and private game reserves offer luxury escapes and barefoot scampers for the intrepid and a good chance to view big cats and more. AN elusive leopard spotted on a rock after days of anticipation, a herd of elephants appearing silently from the bushes, a majestic Bateleur eagle soaring over tree tops, or the rare sighting of an elegant cheetah calling its mate with shrill, bird-like chirps… every visitor to a South African game park comes away with a thrilling, unforgettable story to tell. Then there’s the kids screaming in the background, perhaps one reason why several upscale getaways discourage children below 12 or, for the more flexible, below 16. The only screaming in the wild is supposed to be the romantic sort, or if you get mistaken for a lion’s second course. Whether your first animal sighting is a graceful springbok (South African’s national animal), one of the “Big Five”, or a gangly giraffe, it’s hard to describe the excitement and awe upon finding yourself in the untouched African bush, where animals, birds and plants exist in their age-old natural habitat. And if the Big Five cats elude you at first, there’s always the “Little Five”: the rhino beetle, elephant shrew, leopard tortoise, buffalo weaver and ant lion. A South African safari can challenge your wits and your senses, but you can do it all in style. Pick from five-star resorts, luxury lodges, exclusive hideaways, tented camps or a simple, clean national park chalet – it’s all here in this detailed review of South Africa national parks, private game reserves and lodges. Luxurious pampering sessions in the savannah? A library with rare editions in the bush? Five-star cuisine overlooking a waterhole? It’s all possible. In early 2016, the South African rand exchange rate (US$1 = 13.30 South African rand) was extremely favourable for visitors arriving with dollars and other foreign currencies, making the whole experience even sweeter. Choose between well-run National Parks (managed by South African National Parks [SANParks] or provincial authorities) in arid, coastal, “Bushveld” or mountain regions, with reasonable tariffs and comfortable, clean, serviced accommodation, and pricey, upmarket private game reserves. The latter are often luxurious, with five-star accommodation, exclusive game viewing, and an atmosphere that tends to be personalised and relaxed. Whether you choose the former or latter you are sure to see plenty of animals, but if you go for the private reserve option, sightings of the Big Five are pretty much guaranteed, since your guide and tracker will know roughly where the animals are and will go off-road to find them for you. Having said that, we have spotted all the Big Five on inexpensive self-drives in the Kruger National Park. Game viewing in South Africa's private reserves is done from open-topped four-wheel-drive vehicles. Your guide will explain that predators such as the big cats tend to see the vehicle and its passengers as a single, unthreatening entity. So long as everyone remains seated there is no danger. Guided game-walks are often part of the package. Tariffs usually include all meals (often served outdoors in enclosures known as “bomas”), drinks, game drives and walks. Most national parks also offer organised night drives or early morning drives in park vehicles with guides. Guided walks, hiking, bird watching – and sometimes four-wheel-drive trails – may also be on offer at set times but if you prefer a flexible schedule it’s a good idea to hire a car and explore the national parks on your own. Most parks have rest camps with shops and petrol stations and, sometimes, restaurants. Depending on the park, there would be a range of accommodation, from camping to chalets and guesthouses. Most are equipped with self-catering facilities, or at least a traditional South African outdoor braai (barbecue). Take a look at our South Africa game parks map to get your bearings. South Africa’s Mpumalanga province is internationally known for its wildlife and many of the country's acclaimed game lodges are based here. The area also has mind-blowing scenery – some of the places of interest worth visiting are the spectacular Blyde River Canyon and God’s Window, from where there are sprawling views. The temperate Eastern Cape, the hot, dry North West Province and Limpopo province are also popular game viewing regions. KwaZulu-Natal is known for its scenic diversity: from sandy beaches to soaring mountains. About a third of the province is under some form of private conservation – Ezemvelo KZN Wildlife is the provincial “protected area” agency entrusted with the long-term conservation and management of these areas and the region’s ecosystems. (“Ezemvel”o is the Zulu term for the concept of the environment.) The organisation is separate from South African National Parks. Game reserves in KwaZulu-Natal are spread across the subtropical plains of the east coast and on the upper reaches of some of its larger rivers. The Hluhluwe Imfolozi Park, set in tropical savannah with the Big Five roaming freely, is the oldest proclaimed park in Africa. Other eco-tourism destinations in the province include the iSimangaliso Wetland Park with its lakes and wetlands fringed with Indian Ocean coral reefs, and the spectacular Ukhahlamba Drakensberg Park. With an average altitude of 3,000m, the Drakensberg mountains comprise the highest range south of Kilimanjaro. Both parks have been declared World Heritage Sites. South Africa’s most famous national park is the massive Kruger National Park, comprising nearly two million hectares and situated in Mpumalanga province, bordering Mozambique. About 350km in length and 54km in width, Kruger is about the size of Wales and has nine entrance gates. You can drive for days in there. The Kruger National Park is roughly a five-hour drive from Johannesburg and there are daily flights from Johannesburg to the recently reopened Skukuza Airport inside the park, Phalaborwa Airport, Hoedspruit Airport and the Kruger/Mpumalanga International Airport (KMIA) located between Nelspruit and White River. Daily flights also operate to Skukuza from Cape Town. KMIA also receives daily flights from Durban and Cape Town, and you can also fly from Cape Town to Hoedspruit. Kruger has the greatest variety of wildlife species in the country. It is home to 148 types of mammals, 505 types of birds, 118 types of reptiles, 53 types of fish and 404 types of trees and shrubs. It also boasts ancient bushman rock paintings and archaeological sites. The park, established back in 1898, has 12 main rest camps, four private camps and seven bush camps. Visitors can choose from camping, huts, safari tents, bungalows, cottages, bush lodges and luxuriously appointed guesthouses. Most camps have restaurants, petrol stations and internet. Kruger also comprises nine exclusive unfenced private concessions where guests can stay in luxury lodges in some of the best Big Five viewing regions of the park. You can explore the park by yourself during daylight hours (in an enclosed vehicle), but there is also a range of guided activities on offer. A wilderness trail will take you out of your comfort zone (4,000 rand per person, including three nights in a wilderness camp accompanied by a ranger; no children under 12). Or try a guided morning walk (from R450), sunrise drive (from R240) or sunset drive (from R240). As well as being a major tourist attraction, the park is also very popular with South Africans, so book up to a year ahead, particularly for local school holidays. A good time to visit is in the South African winter when days are mild but nights cold. Kruger Park is in a malaria area – consult a travel clinic or doctor before your arrival for a prescription of appropriate anti-malarial drugs. Don’t forget the repellents. The highest malaria risk is during the December to April rainy season, but doctors recommend year-round prophylaxis. Apart from the Kruger National Park, there are 18 other national parks in different parts of South Africa. Most have overnight facilities. Not all boast the Big Five, but there are plenty of options for serious game viewing. The 28,000-hectare Mapungubwe National Park and World Heritage Site is 230km from Polokwane, the capital of Limpopo province and located at the confluence of the Shashi and Limpopo rivers. The area has a rich history (it is the site of the ancient kingdom of Mapungubwe). It is also rich in traditional San art and a sanctuary to endangered mammals such as the elusive wild dog, and black and white rhino. Mapungubwe, which means “place of the stone of wisdom”, offers a range of accommodation including a tented camp, luxury lodge and camping site. The main camp has a swimming pool and sun deck. Apart from game watching, there are also at least 400 bird species. Take a tree top walk, go on a night drive, watch birds or go on a guided walk. The numbers of game such as leopard, lion, giraffe, and different types of antelope, zebras and baboons, fluctuate with the movement of the animals (they are not restricted by fences). Take precautions against malaria. Summers can be scorching and the best time to visit is during the mild winter months. One of the best places in South Africa to see and appreciate elephants in the wild is the Addo Elephant National Park in the Eastern Cape province, proclaimed in 1931 when the number of elephants in the area had dwindled to only 11. The park, now the third largest in the country, is set in the Sundays River region of the Eastern Cape, 75km from the coastal city of Port Elizabeth. There are regular flights to Port Elizabeth from the country’s major airports, including Johannesburg and Cape Town international airports. The original park was expanded to include a nature reserve and marine reserve (an important breeding habitat for gannets and African penguins), so not only does it contain five of South Africa's seven major vegetation zones (biomes), but it also houses the “Big Seven” (the Big Five, plus the southern right whale and the great white shark) in their natural habitat. Most of the animal action is in the area around the main rest camp, though. The park also has Cape buffalo, black rhino and a variety of antelope species. Quaintly, the flightless dung beetle, found almost exclusively here, have “right of way” on the reserve’s roads. Look out for the signs. The main camp, with a range of serviced accommodation and a tented camp, an indoor/outdoor restaurant, game-viewing area and swimming pool, has two chalets and two cottages adapted for use by people with physical impairment. The PPC Discovery Trail provides easy access for people in wheelchairs and those with impaired sight, and the floodlit waterhole, bird hide, and underground viewing hide are also wheelchair friendly. In Addo, rain occurs throughout the year and the climate is described as “temperate to warm” – bring warm clothes in winter, and a jacket or something fleecy for chilly summer evenings. For a real getaway, choose the vast, remote 3.6 million hectare Kgalagadi Transfrontier Park in the arid Northern Cape province, on South African’s border with Botswana. A large part of the park fall in the southern Kalahari desert. The area with its red dunes, sparse vegetation and dry riverbeds boasts vast herds of different types of antelope, lions and leopard, as well as many types of birds, including birds of prey. If you’re lucky, a black-maned Kalahari lion is a sight you will never forget. Also look out for cute meerkat families. Get there by flying to Upington in the Northern Cape, from where the park is a 260km drive away. Roads in the park have gravel surfaces and a four-wheel-drive is preferable. There is a landing strip where light aircraft may land with prior permission. The park has no surface water and an annual rainfall of only 200mm. There are three rest camps with shops, swimming pools and petrol stations, offering accommodation from camping to family cottages. By early 2016, new riverfront chalets and luxury camping sites were arriving at Nossob camp, which has a predator information centre, but no mobile phone reception and a generator providing electricity for 16.5 hours a day, as does the smallest camp, Mata-Mata. The upgrades run till October 2016. The largest camp, Twee Rivieren, is the only one with phone reception and 24-hour electricity. In addition, several unfenced wilderness rest camps (a maximum of eight people per camp and no children under 12) have armed “tourism assistants” to protect you against predators. The luxurious !Xaus Lodge (pronounced “Kaus” and meaning “heart” in the Nama language), consisting of a central lodge and 12 individual chalets, is owned by the Khomani San and Mier communities. These “Bushman” people were traditionally hunter gatherers living completely off the land. The establishment of the lodge followed a land settlement agreement with the South African government and SANParks. Set on red dunes, the lodge overlooks a massive salt pan with a waterhole where animals come drinking. This is your chance to join a guide in tracking animals, seeking out traditional healing plants and gaze at the pristine Kalahari night sky through telescopes. Visit in the South African autumn and winter (April to September), when days are warm and the mercury can plummet to sub-zero at night. Summer temperatures are scorching. The Karoo National Park set in the vast Great Karoo is a tranquil spot to break the long road trip from the country’s north to Cape Town in the south. The park, which has won various awards for its excellent service and facilities, houses about a dozen lions. One, nicknamed Sylvester, made headlines in 2015 when it escaped from the park, covered about 300km in three weeks and ate about two dozen sheep while being tracked across farms and mountainous terrain. Farmers were relieved when Sylvester was eventually found, darted and returned to the park. It also hosts the Cape mountain zebra that came close to extinction in the early 20th century and high numbers of springbok, as well as black wildebeest, red hartebeest, eland, kudu and other antelope, and black eagles. Activities and facilities include guided game drives, hiking trails and four-wheel-drive eco trails. The park has an immaculate rest camp boasting cottages and units in Cape Dutch style (breakfast included), a campsite, restaurant, wonderful swimming pool, shop, magnificent views and bright, picture perfect night skies. Although the Cape lion, mountain zebra and leopard are no longer found on Cape Town’s famous Table Mountain, the Table Mountain National Park, managed by SANParks, is still home to caracals, hyraxes, baboons, 2,200 species of plants and many birds. Table Mountain is the South African “Mother City’s” most famous landmark and the park offers hikes, forest walks, picnic spots and picturesque accommodation, including Hoerikwaggo tented camps, Olifantsbos Guest House on a secluded beach and Eland Family Cottage. Keep all doors and windows closed against baboons. Do look at our South Africa game parks map to get oriented. Ezemvelo KZN Wildlife manages 110 protected areas throughout KwaZulu-Natal province, aiming to preserve its ecosystems while allowing people sustainable benefits. Accommodation in the KZN Wildlife parks range from rustic mountain caves, cottages and trail huts to bush camps and five-star luxury lodges. 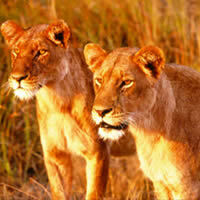 Hluhluwe-Imfolozi Park (Hluhluwe is pronounced “Shlushluwe”) is home to all of the Big Five. The 96,000-hectare park, which is actually two adjacent game reserves (Hluhluwe to the north and Imfolozi to the south), is renowned for “Operation Rhino”, when endangered white rhinos were relocated to havens within South Africa and abroad in the 1960s, saving them from extinction. Ironically, rhinos are now again under severe threat in the park and the rest of South Africa. In 2014, in South Africa alone, 1,215 rhinos were killed by poachers – one every eight hours. This crisis has led to drastically stepped-up monitoring and patrols and what can be described as a war against poachers. See www.savetherhino.org. Wildlife in the Hluhluwe-Imfolozi includes hippo, Nile crocodile, cheetah, giraffe, zebra, baboons and more than 300 species of birds. Go on self-drives, guided walks, boat rides or organised drives on open four-wheel-drives, or explore a self-guided walking trail. The park is located in central Zululand, about two-and-a-half hours’ drive from Durban (six hours from Johannesburg). Mpila camp offer a variety of self-catering options, from chalets and cottages to a tented camp. Award-winning Hilltop Camp also has a restaurant. There are a number of eight-bed lodges, with cooks and field rangers, scattered across the park, including Munywaneni Luxury Bush Lodge, Muntulu and Gqoyeni. Mtwazi Lodge, once the original home of the reserve’s warden, is set under a large fig tree within its own secluded veldt garden. There is also a large range of accommodation options in the town of Hluhluwe 25km away. Summers are hot and humid with frequent thunderstorms, while winters are generally warm and dry during the day, but chilly at night. The iSimangaliso Wetland Park (iSimangaliso means “miracle and wonder”) on the Zululand coast is about 250km from the coastal city of Durban. The 332,000-hectare park contains three major lake systems, eight interlinking ecosystems and Africa’s largest estuarine system, the 80km-long Lake St Lucia. Apart from diverse wetland systems and the highest vegetated dunes in the world, there are many types of antelope to be seen, as well as buffalo, crocodiles, hippo and numerous waterfowls, grassland, forest and sea birds. The park offers a number of campsites, self-catering options and bush lodges and comprises a number of conservation areas, the oldest of which is the St Lucia Game Reserve, established in 1895. Swimming in the lake is prohibited because of the crocodiles. Sugerloaf Campsite, with 92 sites within walking distance of the estuary, has barbecue facilities and plug points, as well as a swimming pool. Eden Park, with 20 sites, is set in a small forest. For hikers, no visit to the region is complete without a trip to the uKhahlamba Drakensberg Park, another World Heritage Site four hours’ drive from Johannesburg and two hours from Durban. The 200km-long Drakensberg (“Dragons’s Mountain”) ranges, snow-capped in winter, separate the province from neighbouring Lesotho. If you’re keen to trace the footsteps of the region’s early hunter-gatherer inhabitants (known as the San), here’s your chance to overnight in a cave. Just remember, those with rock art are off limits and you’re not allowed to make fires in any of them. Bring your own sleeping and cooking equipment, and take your refuse with you. For creature comforts such as satellite television and cosy fireplaces, head instead to the Didima resort at Cathedral Peak where romantics can wallow in the honeymoon suite and the San Rock Art Interpretive Centre provides fascinating insights into the art and culture of the San people. In the central region of the Drakensberg is Giant’s Castle Camp with fully equipped chalets offering from two to six beds, a honeymoon suite, the luxury Rock Lodge sleeping six, a restaurant and bar. In winter, don’t miss the vulture restaurant where you can see the rare bearded vulture and other endangered species feeding. For more romance, head to the Cathedral Peak Hotel, with a stone and thatch chapel, reception venues and honeymoon suites set in secluded gardens. On the Kruger National Park’s western border lie a number of world-famous private game reserves, many of which regularly host international celebrities. Most of the private lodges have their own airstrips and swimming pools. More exclusive game viewing is on offer in the provinces of KwaZulu-Natal, the Eastern Cape, Limpopo, North West, Northern Cape and Western Cape. All the Mpumalanga private game lodges are in the vicinity of the Kruger National Park, about 500km (five hours by car) from Johannesburg. You can also arrange to be flown directly to your lodge or to the Kruger Mpumalanga International Airport nearby. The best time to visit here is in the South African winter (July to August), when days are warm and dry and nights cold. Summer can get very hot with typical afternoon thunderstorms and warm evenings. MalaMala, at over 45,000 acres, is the largest privately owned South African game reserve that is home to the Big Five and acclaimed for its eco-tourism approach. Herds of animals migrate freely between MalaMala and the adjacent Kruger National Park along the unfenced boundary. 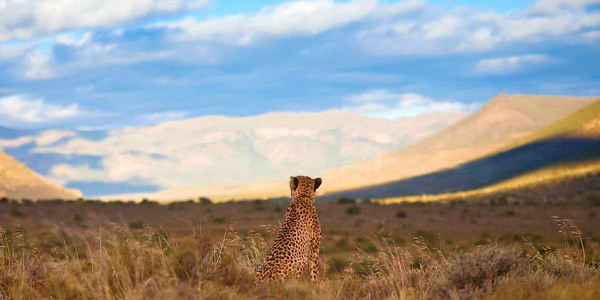 Famous for its leopard, MalaMala has three luxurious camps with air-conditioned chalets. MalaMala Main Camp features 10 luxury suites and eight luxury rooms, as well as a disabled suite. Family rooms are available on request. Each of the air-conditioned rooms enjoys views of the surrounding bush and is equipped with "his" and "her" en-suite bathrooms and insect-proof screens. There is a supervised “junior ranger” programme for children aged four to 12, including animal tracking and game walks. The more intimate Sable Camp accommodates a maximum of 14 people (no children under 12), while the suites at ultra-exclusive Rattray’s on MalaMala function as private homes with heated plunge pools and secluded outdoor showers. There’s a library with rare books and art works, and you can view game while dining on the large wooden safari deck (no kids under 16). Five-star, family-run 30,000-acre Londolozi is a member of the prestigious Relais et Chateaux hotels. All four luxury camps and the private Granite Suites look out over the Sabie River. As at other luxury lodges, you will be treated to day and night game drives, bush-walks, and meals in a bush setting. Newly-weds can book special honeymoon safaris, and offerings also include photographic safaris (pre-book your gear from the photographic studio beforehand) and the Londolozi Cubs Programme for kids. Inyati (meaning “buffalo” in the Shangaan language), set within the Sabi Sand Game Reserve next to the Kruger Park, has 11 thatched, air-conditioned luxury and executive chalets with luxurious en-suite bathrooms accommodating 25 people. The camp also has a small conference centre overlooking the river, swimming pool, gym and river deck for relaxing and game viewing. For a break from game drives and guided bush walks, try fishing in the Sabi River with the sounds of hippo in the distance (and an armed ranger by your side). Sabi Sabi, winner of many prestigious environment and tourism awards, has four luxurious lodges, all unfenced, on the banks of the Sabie River. Selati Camp, with eight opulent suites, was originally built without electricity, but now features overhead fans, airconditioning and other mod cons. Flagship Bush Lodge has 25 luxurious thatched suites, the Amani Spa, EleFun Centre for kids, and huge viewing decks, while Little Bush Camp caters for small groups and features spa baths with river views on each secluded suite deck. 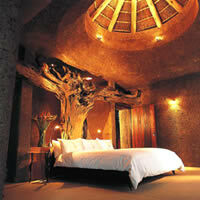 Environmentally sensitive Earth Lodge offers ultra-luxurious accommodation, including the huge Amber Suite. Sabi Sabi also caters for conferences, incentive breakaways, weddings and honeymoons. Also in greater Sabi Sand is Chitwa Chitwa safari lodge, overlooking the largest perennial lake in the Big Five reserve and offering six stylish, private suites, a family suite and exclusive-use villa. Apart from the wildlife sightings from the lodge’s wooden deck, its seamless integration through design and location even allows game viewing from the main lounge and dining areas. From running only one upmarket lodge in the Sabi Sands reserve, Singita now operates 12 lodges and camps across three African countries. Ebony and Boulders, and the private Castleton Camp villa are within the Sabi Sand Reserve, while Lebombo and Sweni camps are on the Kruger National Park’s eastern border with Mozambique, a region known for its large prides of lions. There are also lodges in Tanzania and Zimbabwe. Richard Branson’s Ulusaba is set in more than 10,000 acres of unspoilt African bush, housing the Big Five and many more. There are 21 rooms and suites spread over two lodges. 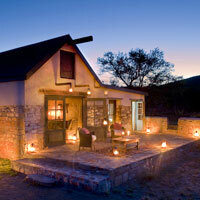 Rock Lodge is set on top of a koppie (a small hill), while Safari Lodge is situated on a dry river bed. 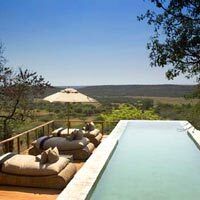 Luxury safari drives and guided game walks are the order of the day, or relax at the Aroma Boma spa at Rock Lodge, 800 feet above the African savannah, with treatments using Africology products and spectacular views. Not too far from Ulusaba is another five-star luxury lodge, Leopard Hills Private Game Reserve, with eight newly decorated glass-fronted suites, each with private plunge pools from where you can gaze over the bush. The gym and the glass-fronted spa sala next to the raised pool deck have spectacular views too. Dine under the stars in the traditional boma or on the upper deck, enjoy silver service in the dining room or – for a romantic end to the day – indulge in a private dinner on the deck of your suite. The andBeyond Ngala Tented Camp on the banks of the seasonal Timbavati River was in early 2016 undergoing a US$2 million upgrade to enlarge suites, bathrooms and private verandas, restyle the swimming pool and build a fitness sala and spa. Ngala is scheduled to reopen on 15 June 2016. Stylish, unfenced, family-friendly Kirkman’s camp (also under the andBeyond umbrella) on the Sand has warthog grazing on the lawn, a library and afternoon tea served on the veranda. 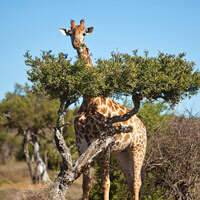 The 75,000-hectare Madikwe Game Reserve, against the Botswana border, is a four- to five-hour drive from Johannesburg. It is one of the largest game reserves in South Africa, housing the Big Five among its 66 mammal species and about 300 bird species. It’s famous for being home to rare African wild dogs. The stakeholders in the reserve are the North West Parks Board, the private sector and local communities. 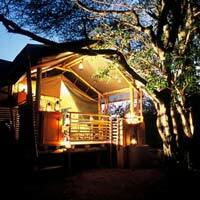 The reserve has a variety of lodges and bush camps. 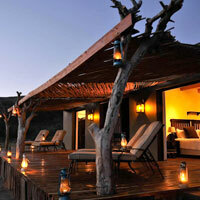 The Thakadu River Camp is a community-run tented safari camp within Madikwe, located on the banks of the Marico River. It is an ecotourism partnership between North West Parks, the Molatedi community and African Hotels & Adventures. The camp comprises 12 large and well-appointed tented suites with private decks overlooking the river. Enjoy South African hospitality, the Big Five and rarer species such as the African wild dog and cheetah at small, luxurious Etali Safari Lodge with eight luxury suites (three of which have direct views of the main lodge waterhole, and one of which is wheelchair-friendly) and two family suites. All have sundecks with heated whirlpools. Fine dining here is “a modern-day fusion of traditional African cuisine with an Asian twist”. Upmarket Jaci’s Safari and Tree Lodges offer specialised photographic, birding, walking and conservation safaris. The Tree lodge has eight “tree houses” and raised walkways. Other Madikwe accommodation choices include Tuningi Safari Lodge with rim-flow pool that overlooks a waterhole and boma dinners under a 300-year-old fig tree, intimate, child-friendly Bush House and Madikwe Safari Lodge, with three independent, exclusive lodges for families, honeymooners and groups. Mosetlha Bush Camp & Eco Lodge is an affordable, unfenced bush camp and eco lodge with raised wooden cabins, bush fare prepared on open fires and oil lamps. Happily, there are hot showers, too. Skilled guides will help visitors experience the Big Five, Madikwe’s famous wild dogs, cheetah and many of the park’s 350 bird species. 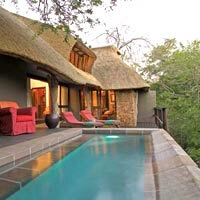 The malaria-free Pilanesberg Game Reserve lies150km northwest of Johannesburg and near the sprawling Sun City resort. It covers about 55,000 hectares, and is located in the crater of a long-extinct volcano. You can fly to Pilanesberg airport from Johannesburg. The 200km of roads in the park are not tarred, but well maintained and accessible by sedan car. The park is managed by the North West Parks and Tourism Board and run as a three-way partnership between the Board, the private sector and local communities. It is set in what in South Africa is known as the “Bushveld”, a transition zone between dry Kalahari and wetter “Lowveld” vegetation. 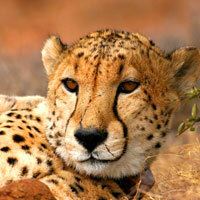 Pilanesberg is home to the Big Five and virtually every mammal in southern Africa, including springbok and brown hyena. Accommodation ranges from camping at Bakgatla camp (R217 per person; children free) to upmarket lodges, including the luxury Bakubung (“Place of the hippo”), Bush Lodge, with 76 air-conditioned rooms with thatched roofs and 66 chalets, all with balconies or patios with views of the hippo pool or park. 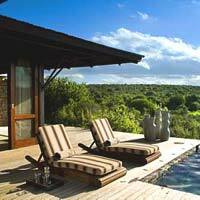 Other options include Ivory Tree Game Lodge and Kwa Maritane. KwaZulu-Natal province is a year-round destination – winter months are mild and dry (but can be cold at night), while rain showers can be expected in the summer months from November to February. Phinda private game reserve on the northern KwaZulu-Natal coast, with views of the Lebombo mountains and bordering iSimangaliso Wetland Park, has big game but is also a birdwatcher’s paradise, with 380 species. The reserve has six luxurious lodges, including Forest Lodge designed in “Zulu Zen” with floor-to-ceiling glass walls, and Mountain Lodge offering birding, photographic, rhino capture and research, tracking, walking, family and private safaris. Zuka Lodge, for the sole use of small groups, has four bush cottages, a personal game ranger, kitchen with dedicated chef, butler, internet, swimming pool and even a private watering hole for game watching. Phinda is a three to four-hour drive from Durban and six hours from Johannesburg, or fly to Durban, Richards Bay, or directly to the Phinda airstrip. 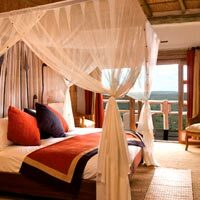 Amakhosi Safari Lodge in Amakhosi private game reserve is set on the bank of Zululand’s Mkuze River, a four-hour drive from Durban. For romantics, there are two Umntwana luxury honeymoon suites with spacious decks, private plunge pools and hammocks overlooking the river. Or choose a river suite in the shape of a Zulu shield and decorated in Zulu style. All Big Five can be seen in the reserve, but for something different, a frog expert is on hand from November to March to take guest on ‘frogging’ safaris at night to marvel at bright coloured frogs and hear their mating calls. The 4,500-hectare private game reserve Thula Thula is 45 minutes from Richards Bay harbour and airport, and less than two hours’ drive from Durban. There is also an airstrip on the property. This is an eco-safari destination and wildlife sanctuary, with, famously, elephant, buffalo, rhino, leopard, giraffe, crocodile, kudu and more. 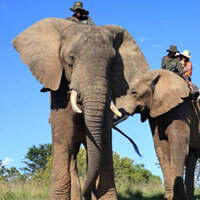 Thula Thula is famous for its ‘elephant whisperer’, conservationist Lawrence Anthony who sadly passed away in 2012. Award-winning Thanda Private Game Reserve, 23km north of the town of Hluhluwe, is a member of the Leading Hotels of the World. (Thanda means “love” in Zulu.) The main lodge has a viewing deck, library and wine cellar, as well as a business centre. The luxury tented camp offers private sun decks and en-suite canvas bathrooms. To add to the bush atmosphere, the camp is non-electrified, but does have limited solar and battery power with a back-up generator to power the tents for a few hours each day. 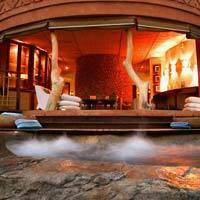 Thanda Spa’s treatments are a combination of Western and holistic Zulu practises. Tailor-made cultural activities include exploring the battlefields of King Shaka, visiting a sangoma (traditional healer) and interacting with Zulu herdsmen and learning about Nguni cattle. The closest international airport is Durban’s King Shaka, a 260km drive away. Or splash out on flight directly to Phinda, a short hop from Thanda, on safari carrier Federal Airlines from Johannesburg International Airport (R4,000 per person, one way). Tembe Elephant Park is a 300sq km reserve on the legendary Ivory Route between Zululand and Mozambique, home to Africa’s largest elephants, the rest of the Big Five and more than 340 species of birds. It is also the ancestral home of the Tembe people, who co-own and manage the Tembe Safari Lodge, with luxurious canvas tents (and en-suite bathrooms!). See a live video stream of what is happening at the Tembe waterhole at www.tembe.co.za. Tembe prides itself on being “the lowest priced full service game lodge” in a national park in Southern Africa. The lodge will arrange for you to fly in to its own grassy landing strip, or travel by road from Durban. The number of five-star game reserves in South Africa’s the malaria-free Eastern Cape province continues to grow. Pumba Private Game Reserve practices eco conservation and is home the Big Five, including rare white lion, hippo, hyena, cheetah, giraffes, various antelope and more than 300 bird species. Water Lodge offers waterfront chalets overlooking Lake Kariega, while Bush Lodge, set on a floodplain, offers luxury thatch and glass chalets. All open onto private game viewing decks boasting plunge pools and outdoor showers. For chilly winters, rooms are fitted with earthenware fireplaces. Here’s your chance to go stargazing, with a field guide interpreting the southern celestial skies and teaching the art of navigation by night using the Southern Cross or Orion’s Belt. The reserve is just an hour’s drive from the Port Elizabeth domestic airport. Kwandwe Private Game Reserve, a two-hour drive from Port Elizabeth, lies on a 22,000-hectare area that has been restored and restocked with African wildlife and now houses thousands of animals including lion, black and white rhino, buffalo and elephant. Kwandwe means “Place of the Blue Crane” in the Xhosa language, and it is home to this endangered national bird. There are two lodges, the Great Fish River Lodge with fold-away floor-to-ceiling glass doors and sweeping views, and chic and trendy Ecca Lodge, with a play centre for kids and all mod cons. Or splash out on sole-use Uplands Homestead or Melton Manor. 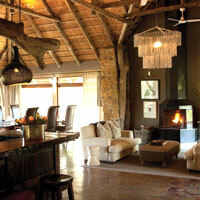 The luxurious, 20,000-hectare private Shamwari Game Reserve is about a 45-minute drive from Port Elizabeth. Family-friendly Shamwari (there are special activities for children, a children’s menu, childminders on hand and age-appropriate gift packs) has received numerous international awards and boasts five eco-systems supporting many forms of plant, animal and bird life, including the Big Five. Choose from six five-star lodges, offering everything from a meditation deck and plunge pools to viewing decks and business facilities. Aspiring photographers with money to burn can book the two-night photographic safari for tuition by professional photographers covering all equipment and editing, with game-viewing vehicle rigged for photographic equipment and more (R5,900 per person, per night). The 7,500-hectare Lalibela Game Reserve also spans five ecosystems. Fly to Port Elizabeth and then drive the 90km to the reserve (about an hour) – or Lalibela will arrange your transfer. There is also a landing strip for small aircraft. Lalibela is home to the Big Five, cheetah, hyena, jackal, lynx, hippo, giraffe, zebra, warthog and numerous species of antelope and has three lodges, Lentaba, Mark’s Camp and Tree Tops (luxury tents with private verandas high on thatched platforms). With no malaria, the Eastern Cape reserves are ideal for families and Lalibela has a special, flexible children’s programme, complete with a special game drive vehicle for kids and shorter drives. The children’s rate is half that of adults and includes all meals, drinks, drives and the kids’ programme. Samara Private Game Reserve, on 28,000 hectares, near the town of Graaff Reinet and about two and a half hours’ drive from Port Elizabeth, has won a host of international awards. Endangered species here include the Cape mountain zebra, the vulnerable blue crane (South Africa’s national bird) and cheetah. Other cats in the reserve include the caracal, the small spotted cat, the African wild cat and the leopard. Samara is also one of the few places in the country where you can see the elusive, nocturnal aardvark. The Karoo Lodge Karoo Lodge combines colonial comforts with the essence of nature, while the historic homestead Manor at Samara offers the services of a personal ranger, butler and chef. Drive directly to Samara or fly into Port Elizabeth from where the lodge can assist with transfers. Samara also boasts a private landing strip for direct charter flights. Gondwana Game Reserve lies within four hours’ drive from Cape Town and a stone’s throw from the famous Garden Route with its endless white beaches and championship golf courses, including Pinnacle Point, Pezula, Oubaai and Fancourt. George airport is just 45 minutes away. The reserve is set on 11,000 hectares of grass plains with indigenous “fynbos” vegetation and valleys surrounded by the Outeniqua Mountains. Malaria-free and with a year-round moderate climate, Gondwana is the result of a major rehabilitation programme. Lion, leopard, rhino, elephant and buffalo, and many species of buck, including the endangered Cape mountain zebra and kudu, were re-introduced in the two years ahead of its opening. Kwena Lodge offers 14 sumptuous freestanding suites modelled on traditional Khoi San circular dwellings, 180-degree views and skylights for star-gazing. The “Afro-chic” Bush villas come in two-, three- and four-bedroom configurations, and there’s a brand-new Eco Camp offering six-day conservation programmes. Kagga Kamma Private Game Reserve, in a wilderness area three hours’ drive from Cape Town, features dramatic rock formations and hundreds of Bushman rock paintings of up to 6,000 years old. No Big Five here, but plenty of other animals, birds and views on offer. Take a guided quad bike safari or relax at the spa. 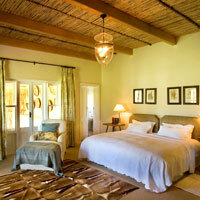 Bushmen Lodge offers five large en-suite thatched “rondavels” and 10 “cave suites” with private terraces. Bushman’s Kloof wilderness reserve and wellness retreat, 270km from Cape Town in the foothills of the Cedarberg mountains and within the Cape Floral Kingdom UNESCO World Heritage Site, is a 7,500 hectare malaria-free sanctuary. There are abundant wildlife and flora (but no predators) and more than 130 Bushman rock art sites. Stay at the luxurious Main Lodge, which was recently totally renovated, housing a maximum of 32 guests in 16 rooms, or Koro Lodge farmhouse. Expect all mod cons, four swimming pools, indulgent spa treatments, award-winning cuisine and more. Natural drives, walks, birdwatching and organic garden tours are the order of the day. Summer days in this region are very warm and mostly dry, while winters can be chilly with very low temperatures at night and even snow on the high Cedarberg peaks. For the Big Five, day trips, horseback and quad bike safaris, four-wheel-drive trails, fishing and more, Aquila private reserve is set in the Little Karoo, a two-hour drive from Cape Town. The reserve recently made headlines for its hand-rearing of a baby rhino after the newborn was abandoned by its mother. Aquila offers a choice of premier, family or luxury chalets, and activities include a 35m saltwater swimming pool with trendy pool bar, conference centre, children's entertainment area and library. The South African game parks and reserves mentioned here constitute just the tip of the iceberg. There are countless more, as well as many nature parks showcasing the country’s indigenous fauna and flora. The South African currency is the South African rand, and all prices are listed in rand. The currency tends to fluctuate a fair bit. Exchange rate US$1= 13.30 South African rand. Some further useful information on South Africa from Jen Reviews. Room rates normally include 14 percent VAT and may range from R500 for a night in a tent to R580-R650 per person per night (sharing) usually all inclusive, or R2,500-R4,100 for an upscale lodge going up to R150,000 for an entire camp housing eight as at Castleton. Conservancy fees may range from around R150-R250 depending on the park. Safari maps: We have a South Africa game parks map to help you get your bearing. Game-viewing is possible throughout the year in South Africa, but the ideal time to visit many of the game areas (the Eastern Cape and Western Cape are exceptions) is from April to September, during the South African autumn and winter. Most of the game areas have summer rainfall, and the animals are more difficult to spot when the vegetation is denser (although spring is a great time to see baby animals). The best time of the day to see game is in the early morning or late afternoon through to dusk, when animals tend to be most active. Most animals rest (and are therefore not very visible) during the heat of the day. Bring comfortable shoes and a warm jacket – winter nights are cold and you need to wrap up warmly for night and early morning game drives. Although most of South Africa is malaria free, the Kruger National Park and surrounding private reserves, as well as parts of KwaZulu-Natal, do fall in malaria-risk areas. Visit a travel clinic or doctor before your arrival to get a prescription for malaria prophylaxis, call South African National Parks’ 24-hour malaria hotline (tel: [27-13] 7355-638) or visit www.nicd.ac.za/ for advice. Try to avoid being bitten by mosquitoes by wearing long trousers and long-sleeve shirts and using insect repellents. Should you develop flu-like symptoms after having been in a malaria area, visit a doctor and asked to be tested for malaria. National and toll roads in South Africa are generally well maintained and signposted but, outside the Western Cape, municipal roads may be less well maintained or even poor. Expect to pay from around R190 per day (including VAT) for the smallest saloon car, such as a Kia Picanto, but administration fees and damage waivers could push this up to around R260. Car rental companies include Avis (book online at www.avis.co.za or tel: [27-861 021 111), Europcar (www.europcar.co.za), Budget (tel: [27-11] 398-0123, www.budget.co.za) and Tempest ([27-11] 578 8300, www.tempestcarhire.co.za). Bookings for national parks managed by South African National Parks (SANParks) are centrally managed. You can check availability and book directly online. Daily conservation fees range from park to park. The standard rates are given below. Kids pay half. The national parks offer a wide range of accommodation, and the rates given below reflect just a small fraction of the options available. For more information, visit the SANParks website. SANParks central reservations. Tel: [27-12] 428-9111, fax: 343-0905, (e-mail: reservations@sanparks.org or www.sanparks.org). Or book via the convenient, efficient real-time online reservation system (www2.sanparks.org/bookings). Addo Elephant Park. Conservation fee, R216. Wide range of accommodation include safari tents from R670, chalets from R870, family chalets from R1,495 and cottages from R1,220. Karoo National Park. Conservation fee, R152 per adult. Chalets (sleeps three, with breakfast) from R1,165; camping (up to six people in group), from R205. Kgalagadi Transfrontier Park. Conservation fee, R264. Family chalets from R1,220 (sleeps up to six), chalets (sleeps two to six) from R750. Kgalagadi’s !Xaus Lodge. Tel: [27-21] 701-7860 (office), (e-mail: reservations@tfpd.co.za or www.xauslodge.co.za). From R3, 990 per person, sharing. Kruger National Park. Conservation fee, R264 per adult. Bungalows at Skukuza camp from R915 (sleeps two/three), family cottage, R1,745 (sleeps four), safari tent from R460 (sleeps up to four). There’s a myriad additional options at this and the other camps. Mapungubwe National Park. Conservation fee, R152 (R76, child). Cottage from R1,010 per night (sleeps up to four). Table Mountain National Park. Conservation fees depend on the part of the park you access. Accommodation from R985 per night for Duiker or Eland Family Cottages, sleeping four; two-bed tents from R510 (sleeping two). Ezemvelo KZN Wildlife. Central reservations for all accommodation run by the authority, including those listed below. Tel: [27-33] 845-1000, fax: [27-86] 505 8889 (e-mail: bookings@kznwildlife.com or www.kznwildlife.com). Or for secure online bookings, go to https://bookings.kznwildlife.com. In addition to the details below, prices vary wildly between the various lodges and camp. See the website for information. Hluhluwe-Imfolozi Park. Daily conservation levy R175 (R90, children between three and 12, and discounts for South African residents). Accommodation from R870 per adult per night in a chalet or safari camp sleeping two in Mpila. 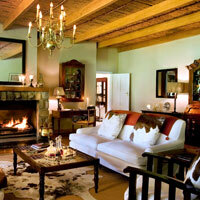 Self-catering chalets from R600 per adult per night. Eight-bed Mtwazi Lodge at Hilltop, minimum charge, R4,800. iSimangaliso Wetland Park. Entry at most of the camps is R50 per vehicle and R40 per adult. Community levy, R5 per person. Contact bookings@kznwildlife.com for details and rates for camping, self-catered units and catered lodges. The Ukhahlamba Drakensberg Park. Cathedral Peak and Nidima, day visitor park permit fee, R40 (adult), R20 (child). From R1,420 per adult sharing, standard room (including all meals and morning and afternoon tea); honeymoon suite, R1,890, Cathedral Peak. In addition to the contact details supplied below, most private game lodges have online booking facilities via their websites. Inyati. Tel: [27-11]486 2027, fax: 486 0301, (e-mail: inyatigl@iafrica.com or www.inyati.co.za). From R6,100 (double), valid until December 2016. Includes all meals, game drives, night safaris, fishing and more. Londolozi. For reservations, www.londolozi.com/en/enquire or www.londolozi.com. Rates depend on length of stay. From US$580 per person per night in a Varty Camp chalet (all inclusive), if you stay one to four nights. MalaMala. Tel: [27-11] 442-2267, fax: 442-2318, (e-mail: reservations@malamala.com or www.malamala.com). Rates from US$650 per person sharing, per night, including all meals, game drives and walks and ground transfers. Sabi Sabi. Tel: [27-11] 447-7172, fax: 442-0728, (e-mail: res@sabisabi.com or www.sabisabi.com). Suites from R11,500 per person per night sharing. Includes game drives and walking safaris, all meals and other extras. Singita. Tel: [27-21] 683-3424, (e-mail: reservations@singita.com or www.singita.com). Singita Boulders and Singita Ebony lodges from R23,875 per person per night, including all meals and drinks (except French champagne), safaris, surface transfers, laundry and valet services. Castleton Camp is sold as a complete camp, R153,600 per night (one to eight guests). Ulusaba. Tel: [27-11] 325-4405, (e-mail: enquiries@ulusaba.virgin.com or www.virginlimitededition.com/en/ulusaba). 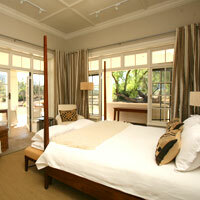 Safari Room from R6,300 per person, double. Ngala Tented Camp. (Tel: [27-11] 809 4300 (e-mail: contactus@andBeyond.com or www.andBeyond.com). From R9,075 per person, including three meals, soft and local alcoholic drinks, transfers, nature walks, safari activities and more. Kirkmans Camp. Tel: [27-11] 809 4300 (e-mail: contactus@andBeyond.com or www.andBeyond.com). From R7 260, fully inclusive. AmaKhosi Safari Lodge. Tel: [27-34] 414 1157, (e-mail info@amakhosi.com or www.amakhosi.com). From R2,650 (low season) per person, sharing. Includes meals and two game drives a day. Phinda. Tel: [27-11] 809-4300, (email: contactus@andBeyond.com or www.andBeyond.com). Forest Lodge and Mountain Lodge rates from R6,600 per person sharing, includes meals, drinks and house wines, beers and local spirits, game drives and nature walks and emergency medical evacuation insurance. Zuka Lodge from R7,710. Thanda Private Game Reserve. Tel: [27-35] 573 1899, fax: 573 1877, (e-mail: reservations@thanda.co.za or www.thanda.com). From R7,500 per person (lodge accommodation); tented camp from R3,850. Tembe Elephant Park. Tel: [27-82] 6512 868, fax: [27-31] 266 8718, (e-mail: info@tembe.co.za or www.tembe.co.za). 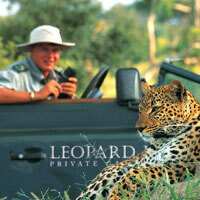 From R1,250 per person, sharing, including all meals, game drives, transfers, tea and coffee. There is also a R35 vehicle entrance fee, once-off R30 conservation levy per person and R30 per night community levy. Thula Thula. Tel [27-82] 259 9732 (email: thula@netactive.co.za or www.thulathula.com). 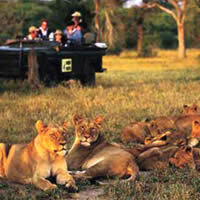 From R2,500 per person (double or single), Safari lodge or tented camp. Kwandwe Private Game Reserve. Tel: [27-46] 603 3400, (e-mail: reservations@kwandwe.co.za or www.kwandwe.com). From R7,850 per person sharing, low season. Closed in June. Lalibela Game Reserve. Tel: [27-41] 581-8170, (e-mail: stay@lalibela.co.za or www.lalibela.net). R3,975 per person sharing per night (including all meals, drinks and two game drives). Pumba Private Game Reserve. Tel: [27-41] 502 3050, fax: [27-46] 603 2001 (email: reservations@pehg.co.za or www.pumbagamereserve.co.za). From R5,850, adult sharing; R1,150, child (all inclusive). Samara Private Game Reserve. Tel: 27-+27-23] 626 6113, (e-mail: reservations@samara.co.za or www.samara.co.za). From R2,420, low season (May to August). Shamwari Game Reserve. Tel: [27-42] 203 1111, (e-mail: reservations@shamwari.com or www.shamwari.com). Low season, all-inclusive rates from R4,725, all inclusive. Gondwana Game Reserve. Tel: [27-21] 555 0807 (e-mail: reservations@gondwanagr.co.za or www.gondwanagr.co.za). R5,300 per person includes breakfast, dinner, high tea. Bushman’s Kloof. Tel: [27-21] 437-9278, (e-mail: reservations@bushmanskloof.co.za or www.bushmanskloof.co.za). From R4,015 per person sharing (high season). Aquila. Tel: [27-21] 430 7260 (e-mail: res@aquilasafari.com or www.aquilasafari.com). From 1,995 per person sharing. Madikwe Game Reserve. Visit www.madikwegamereserve.co.za for information. Entry, adults, R160; children, R65. Jaci’s Lodges. Tel: [27-83] 700 2071/419 1334, (e-mail: jacisreservations@madikwe.com or www.makikwe.com). From R3,695 per person, low season. Etali Safari Lodge. Tel: [27-12] 346 0124, (e-mail: reservations@etalisafari.co.za or www.etalisafari.co.za). Thakadu River Camp. From R2,362 per person, sharing, including three meals a day, two game drives daily, afternoon tea and coffee. The Bush House. Tel: [27-76] 694, (e-mail: reservations@bushhouse.co.za or www.bushhouse.co.za). From R3,350 per person sharing (May to August 2016); R750 for children under six. Tuningi Safari Lodge. Tel: [27-11] 781 5384, fax: [27-86] 249 7487, (e-mail: reservations@tuningi.co.za or www.tuningi.com). From R4,800 per person sharing, May-July 2016; from R5,500, August to December 2016. Jamala Madikwe Royal Safari Lodge. Tel: [27-82] 927 3129, (e-mail: info@jamalamadikwe.com or www.jamalamadikwe.com). From R6,450 per person, sharing, including meals, game drives and soft and alcoholic drinks. Mosetlha Bush Camp & Eco Lodge Tel: [27-11] 444 9345 (e-mail: info@thebushcamp.com or www.thebushcamp.com). From R1,495 per person per night sharing. Pilanesberg Game Reserve. Tel: [27-14] 555-1600 (for enquiries only), fax: 555-5525, (e-mail: pilanesberg@nwptb.co.za or www.parksnorthwest.co.za/pilanesberg-national-park). Entry, R65, adults; R20, children, vehicles, R20. Bakubung Bush Lodge. Tel: [27-14] 552 6000, fax: 552 6300, (e-mail: bakubung@legacyhotels.com or www.legacyhotels.co.za). 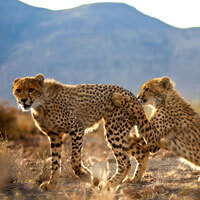 From R4,800, double, per room per night, including dinner, breakfast and one complimentary game drive per person. Minimum two-night stay over weekends. Ivory Tree Game Lodge. Tel [27-14] 556 8100, (e-mail: gm@ivorytree.co.za or www.Ivorytreegamelodge). From R4,300 per person, sharing. Kwa Maritane Bush Lodge. Tel: [27-14] 552 5100, fax: 552 5333 (e-mail: kwamaritane@legacyhotels.co.za or www.legacyhotels.co.za). From R6,600, double.